As many parts of the country experience season's first showers that are bringing smiles on the flushed and sun-tanned faces, everyone is looking forward to welcome the most-awaited rainy season. Though we are used to the warm and tropical weather, there's nothing quite like the feeling of soaking in the monsoon rains. To enjoy the bliss, head to a place that compliments the amazing weather perfectly. There are so many places which fit the bill, but today we'll tell you about Amboli - a fairly unexplored hill station in the Sindhudurg district of South Maharashtra, that boasts an unbelievably good weather. This pretty little hill station, nestled in the hills of the Sahyadri ranges in the state of Maharashtra, is a perfect place to be at and enjoy the lovely pre-monsoon weather. Despite its lush and surreal landscapes and natural splendour, Amboli stayed off the tourist map for far too long. Since Amboli receives plenty of rainfall making it the wettest region of Maharashtra, the Amboli hills are also home to numerous waterfalls cascading down the lush emerald slopes. It is quite a sight when the entire landscape lush with verdant valleys is engulfed in thick, cool mist. Amboli is well-connected and easily accessible from the nearby major cities of South Maharashtra, Goa and North Karnataka. The nearest airport at Belgaum is 80 km away from Amboli. The Amboli village can also be reached by travelling for 84 km from Panjim, Goa. Few of the nearest railway stations are Sawantwadi, Kolhapur, Belgaum, Miraj, etc. And while Amboli is around 490 km and 345 km from Mumbai and Pune respectively, it is relatively closer from other major cities like Kolhapur (110km), Sangli (150km) and Sawantwadi (28 km). Several Karnataka & Maharashtra State Transport buses regularly shuttle between Belgaum and Sawantwadi via Amboli. 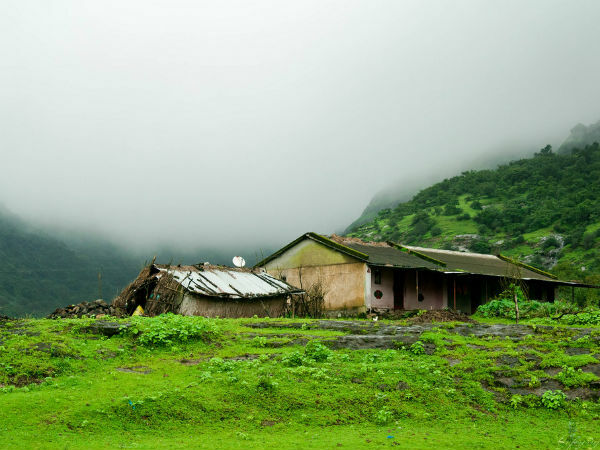 Amboli being a hill station experiences a pleasant climate and therefore, can be visited throughout the year. The best time to visit though is between June to October, which enhances Amboli's beauty manifold. Ideal for a laidback and relaxing mini-vacation, Amboli is a perfect weekend getaway from Goa and major places in Maharashtra like Mumbai, Pune etc. Although the best way to enjoy the place is to simply sit back, relax and enjoy the amazing weather, while munching on some delicious local cuisine, this picture postcard hill station, however, has some really good places that can be visited leisurely and be absorbed in the beauty of the surreal place. It is one of those quiet, unpolluted places that help you connect with nature. The glorious Amboli Waterfall allures many tourists and visitors every year. Come monsoon and the waterfall transforms into a roaring beauty with its captivating surrounding of lush green in full bloom. It is quite a sight and people often visit it more than once during their stay in Amboli. The Amboli Waterfall is located at a distance of approximately 3 km from the main bus stand. Located about 2 to 2.5 km from the Amboli Bus Stand, Mahadevgad is a spectacular point which offers magnificent views of the surrounding valleys, hill, mountain ranges and even the Arabian Sea! Do take help of locals and ask for directions if you are venturing out alone or in small groups, as the road condition isn't great and also there aren't many signboards. Similar to other hill stations or elevated regions, Amboli too, has the highest point which offers mesmerizing views of the sunset. No two sunsets are same and therefore, each sunset you'll witness here will be a unique experience that will stay with you forever. The sunset point is located about a kilometre from the main bus stand. The Nangarta Falls is located at a distance of 10 km from the Amboli village. Here the water falls from a height of over 40 ft into a deep, narrow gorge making a loud sound that cannot be missed, especially during monsoons. You can enjoy the beauty of the entire place from a bridge that is constructed near the falls for viewing purpose. A fresh mountain stream originates in the deep caves near Amboli village and goes by the name of Hiranyakeshi River. The caves also house an ancient Shiva Temple known as Hiranyakeshwar Shiva. The caves around the temple are difficult to access and are quite unexplored. So if you are into caving and wish to explore the place, it is advisable to seek the guidance of a local. This place is about 5 km from the Amboli bus stand. According to legends, it is believed that there once were 108 Shiva Temples in and around Amboli, of which only a few have been discovered so far. So if you are an Indiana Jones fan, here's your chance to unearth some mysteries that are buried deep within the Earth's crust! About 2 km from the Amboli bus stand, you can find temples dedicated to Lord Ram, Hanuman & Ganesh. This temple complex also houses a mausoleum of a renowned saint of the region. There are also a few treks and trails around Amboli that one can enjoy. In essence, walking around this beautiful village with verdant greens all around and fresh streams gurgling somewhere not too far away, can turn even a simple walk into a memorable one.